Senior Leadership Teams spend countless hours in strategy planning and execution, implementing LEAN, doing Project Management, and undertaking team building activities but are still not able to get the desired results. 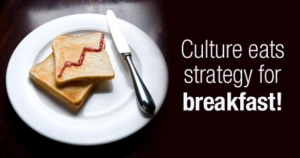 Research has identified the missing link that differentiates a top performing organization with others is their ‘CULTURE’ – an unseen force that not only drives organizational excellence but also sustains transformational change. KUMAR FRIENDS INC. offers ‘Culture Assessment and Alignment’ as one of our key services to support client organizations in their journey to operational excellence and culture transformation. In Canada, we are one of only three firms trained to conduct a culture assessment for an organization using OCAI (Organizational Culture Assessment Instrument). Copyright © 2016 KUMAR FRIENDS INC.